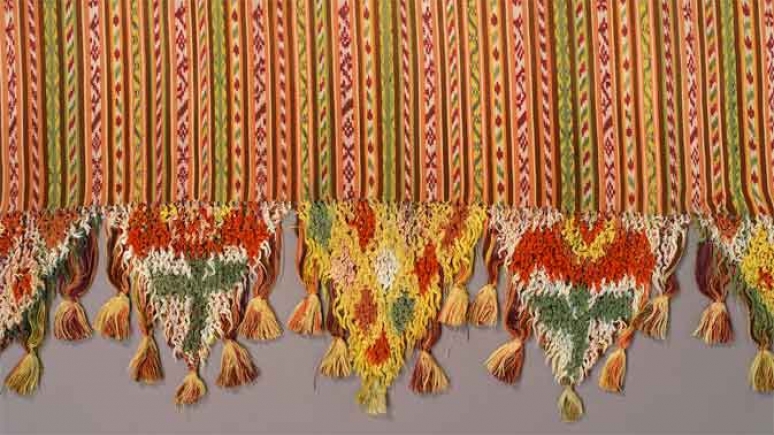 The Royal Ontario Museum in Toronto, Canada, continues to showcase Mexican textiles in a major exhibition entitled Viva México! Clothing and Culture. The exhibition opened in May this year and closes 23 May 3, 2016. It occupies the museum’s Patricia Harris Gallery of Textiles & Costume. 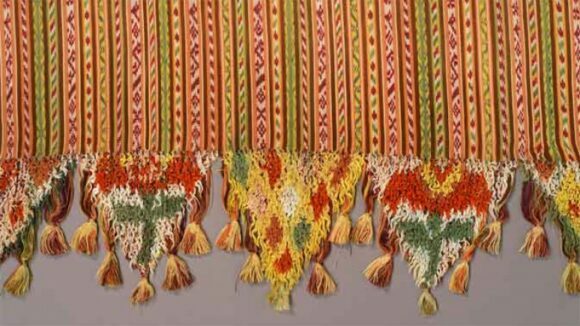 Even though the museum’s collection of Mexican textiles is one of the largest and most important collections of its kind in the world, very few items from the collection have ever been publicly displayed previously. Rebozo (detail), Ikat-patterned silk, Mexico, 1825-1875. Gift of Mr. and Mrs. W.K. Newcomb. The guest curator for this exhibition is Chloë Sayer, a specialist in Mexican popular art and author of numerous works on the subject, including Costumes of Mexico (1985); Arts and Crafts of Mexico (1990); Mexican Patterns: A Design Source Book (1990); Mexico: The Day of the Dead: An Anthology (1993); Mexican Textile Techniques (1999); Textiles from Mexico (2002); and Fiesta: Days of the Dead & Other Mexican Festivals (2009). The exhibition comprises about 200 pieces, some dating back to the nineteenth century. “The collection tells the story of Mexican textiles through centuries, and that’s why it’s so valuable,” Sayer said. Sessions when visitors to the exhibition can watch Mexican artists hand-crafting traditional textiles are also scheduled on a regular basis. There are significant regional differences in the “typical” traditional textiles in Mexico. This exhibition delves into the geography of Mexican textiles and brings long-overdue attention to their extraordinary diversity. A huge industrial development plan looks set to get underway shortly in the narrow Isthmus of Tehuantepec in southern Mexico. 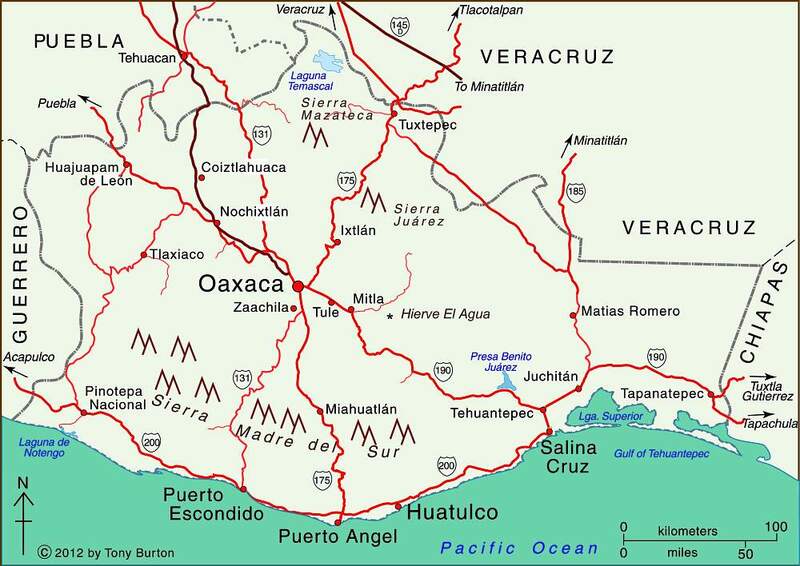 The low-lying Isthmus of Tehuantepec separates the Chiapas Highlands and the low Yucatán Peninsula from the rest of Mexico. The Isthmus was once considered as an alternative location to Panama for a trans-continental canal. During Mexico’s internal Reform War (1858‑60), between the liberals, led by Benito Juárez, and the conservatives, both sides encountered serious financial problems. At one point in this war, the liberals accepted an offer from the USA to receive four million pesos in exchange for the USA having the “right of traffic” across the Isthmus of Tehuantepec “in perpetuity”. Fortunately, this treaty was never ratified by the US Senate. In recent years, the Tehuantepec area has received massive investments in wind power, with several major wind farms already operational and more on the drawing board. The latest plans will build on those investments to provide upgraded infrastructure meeting the preconditions for industrial development. 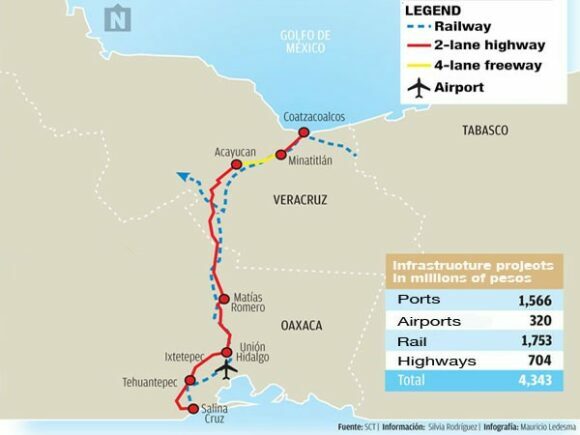 The 300 million dollars allocated to the first phase of the Trans-Isthmus Project will improve railroads, highways, airports, and the ports of Coatzacoalcos on the Gulf Coast and Salina Cruz on the Pacific Coast (see map). During the second phase, private sector financing will add industrial development areas, which should boost the area’s contribution to national GDP from 2% to 4.5%, and raise the regional GDP/person to $10,000 a year, close to the national average. The federal government has designated this region as a special economic zone, offering several fiscal incentives to new enterprises. Chinese investors have already expressed interest in building a 200-million-dollar steel manufacturing plant in the isthmus, utilizing nearby iron ore reserves to produce 3 million tons of steel a year. In November 2012, the federal Environment and Natural Resources Secretariat (Secretaría de Medio Ambiente y Recursos Naturales, Semarnat) refused a request to allow open-pit (opencast) mining in the buffer zone of the Sierra La Laguna Biosphere Reserve in Baja California Sur. The request came from Zapal SA de CV, whose mining project, currently named “Los Cardones”, is located about 60 km from La Paz, the state capital. The proejct is close to the small settlements of El Triunfo, San Antonio and El Rosario. This mining project was previously called “Paredones Amarillos” and “La Concordia”. The original Concordia project, proposed by US mining firm Vista Gold and Toronto-listed Argonaut, was opposed on environmental and public health grounds by several environmental groups including the Mexican Center for Environmental Law (CEMDA). 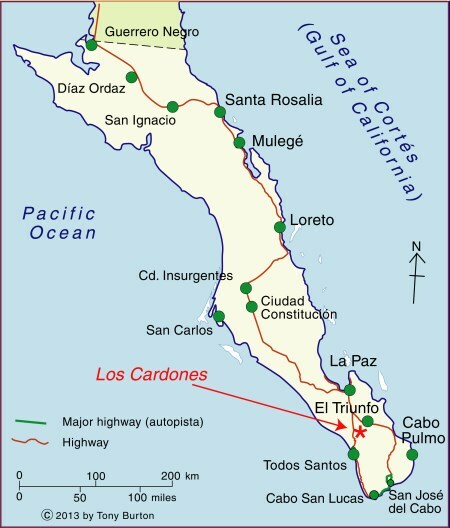 Location of Los Cardones mining project. The latest version, Los Cardones, was resubmitted to authorities in September 2012. The project involved 423 hectares of semi-arid scrub-land, from which Zapal hoped to extract 40 metric tons of gold in the next decade using open-cast (pit) mining. The $217-million project would have created around 2200 jobs. According to the project’s website (no longer functional), the mining project would have relied entirely on desalinated seawater (brought to the site by a 40-km aqueduct), which would be continuously recycled, and would therefore have no impact on local aquifers. Zapal claimed that the mine would have been the first gold mine in Mexico to use a closed-system cyanidation process, designed to prevent any contamination of the local environment. Zapal is part of the Invecture group which already operates an open cast copper mine in Piedras Verdes, Sonora, claimed to have an impeccable environmental and safety record. Semarnat rejected the proposal on the grounds that it did not meet the legal requirements for mining operations in a Biosphere Reserve buffer zone. It is likely that a revised application will be made in due course. However, officials of the Baja California state government have previously gone on record as saying that they will oppose any open-cast mining in the state, because of its potential environmental impacts. David Bacon, author of “The Right to Stay Home: How US Policy Drives Mexican Migration”, wrote an informed account for the American Program website of several cases across Mexico where opposition to Canadian mining firms has arisen. minera!” (Yes to life! No to mining!). It was held to co-ordinate local resistance to the human and environmental costs of mining on the region’s communities. Goldcorp’s Los Filos mine in Guerrero: mega-mine or mega-disaster? San Mateo Rio Hondo (40 images) San Mateo Río Hondo, a town and municipality in Oaxaca, is situated in the Miahuatlán District in the south of the Sierra Sur. Her informal images capture the personalities and sights of these events, warts and all. Roderick has a keen eye for subject matter, color and detail. Her fine photographs bring these events and the magic of Oaxaca to life for her viewers. In an earlier post, we looked at the benefits brought by Mexico’s street markets (tianguis) to both vendors and consumers, and mentioned their long history. 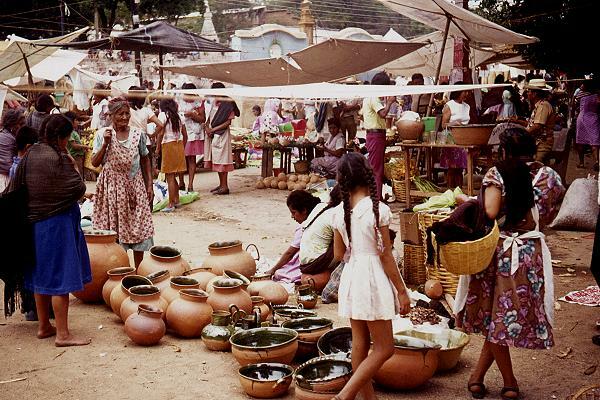 But where, when and why did the first street markets emerge in Mexico? While there is ample evidence of long-distance trade at least as far back as the Olmec (1500 BC to 200 BC), and we know that there was regular long-distance trade during Aztec times, this trade did not necessarily involve market places and market activity. Richard Blanton and his co-authors in Ancient Mesoamerica: a comparison of change in three regions offer some insights into how markets may have developed in the Oaxaca region of Mexico. They point out that relatively little archaeological work has been done on finding the origins of market systems. The major reason for this is because of the paucity of direct archaeological evidence of market activities. Finding “exotic” items (those originating from outside the area) is a clear indication of barter or trade, but does not prove that there was a regular market.There is little or no evidence of the former market stalls and activities for archaeologists to work with. However, several million ceramic pieces found in the Oaxaca area have been collected, and systematically cataloged by complexity of form, and hence, difficulty of manufacture and likely “value”. Blanton and his colleagues explore the idea that the distribution of these ceramics can be used to map ceramic production sites and provide a “faint image of the structure of the region’s marketing system”. Echoing central place theory, they write that, “A market system and its specialized producers can’t be supported if the producers can’t make a living. They have to be able to supply a sufficiently large number of households that are willing and able to consume a sufficiently large quantity of their goods.” The “demand threshold” is the minimum demand sufficient for a particular product to be worth producing. People will travel further to purchase a higher cost or rarer item (which has a higher demand threshold), which will be produced in only a single or very small number of locations. According to Blanton and his colleagues, the data for ceramic types in the Valley of Oaxaca confirm that as early as 500 B.C., only one site contained evidence for the most costly (intricate; many steps involved in production) form of ceramics. This site was located in the center of the valley. On the other hand, a larger number of production sites for less costly ceramics were found, scattered around the valley, each site apparently supplying a small local area. While this is not conclusive proof of regular markets, it is certainly strongly suggestive that this is how markets originated in this region. More than two thousand years later, the Oaxaca Valley still has some of the most colorful and vibrant markets in Mexico. 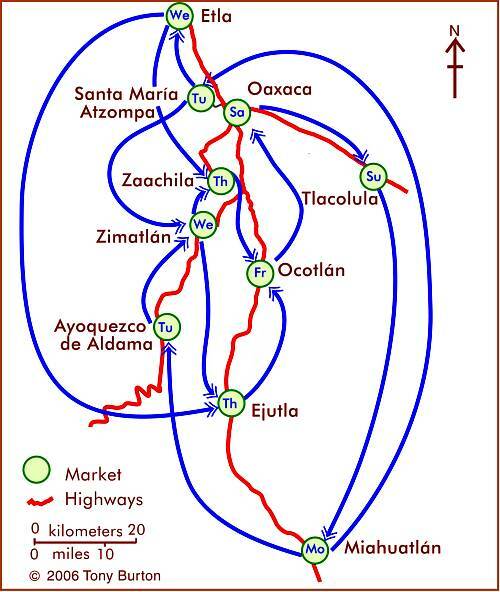 The map shows the market day for major markets in the area around the city of Oaxaca. For more details, see Markets in and near the city of Oaxaca. Blanton, Richard E., Stephen A. Kowalewski, Gary Feinmann and Jill Appel. Ancient Mesoamerica: a comparison of change in three regions. Cambridge University Press, 1981. Oaxaca’s single biggest cultural event, held in the second half of July, has come to be known as the Guelaguetza, which is Zapotec for “offering” or “mutual help”. It celebrates the cultural and ethnic diversity of the state. 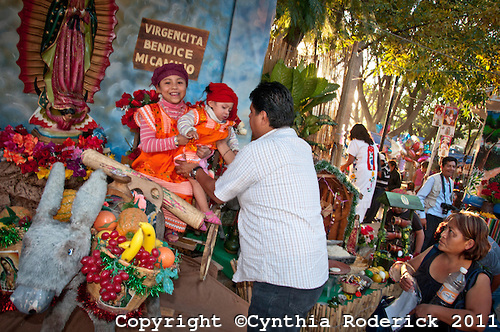 This year’s edition (the 80th) of the Guelaguetza ends on Monday 30 July, so this is the final weekend. A massive open-air amphitheater, seating 100,000 people, is a permanent fixture on the side of the Fortín hill which overlooks the north west quadrant of Oaxaca city. The original Aztec garrison (for the collection of tributes), known as Huaxyacac, was established by Ahuitzotl at the end of the fifteenth century on this very hill. Today, a massive statue of Benito Juárez (cast in Rome in 1891) stares out over the suburbs. 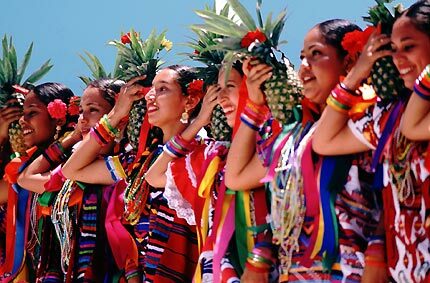 The Guelaguetza may have its origins in Mixtec and Zapotec celebrations of their corn crop. Later, the festival was carried on by the Aztecs in honor of their corn god, Xilonen. Later still, in the eighteenth century, the Spanish Carmelite missionaries linked the festival to their own Christian rites for the Virgen del Carmen (16-24 July). The timing holds even more significance today since July 18 also marks the anniversary of the death of Juárez, a much-revered politician of humble, indigenous origin, who served five terms as president of Mexico in the nineteenth century. In the 1930s, the fiesta of the Guelaguetza took on its modern hybrid form, which includes a parade of stilt-walking “giants”. 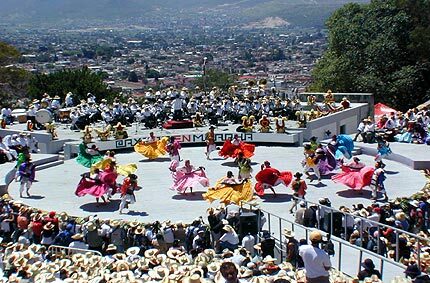 During the Guelaguetza, the Fortín hill is the scene for spectacularly colorful regional folkloric dances performed by several different ethnic groups (Mixtec, Zapotec, Trique, Popolac, Chootal, Chinantec, Mazatec, Mixe) from the seven main geographic regions of the state. The entire city comes alive with color. Color is everywhere from the beautifully hand-embroidered dresses and huipiles, to the food, to the paper streamers decorating the streets and to the mixture of merchandise sold on the sidewalks. For travelers unable to visit in July, some central hotels, including the Camino Real, luxuriously housed in an architecturally-gorgeous former convent, and the Monte Alban opposite the cathedral, offer a weekly, scaled-down version of the Guelaguetza, year-round. Many remote settlements in the mountains of Oaxaca are still not connected to the national electricity grid. A project based in the municipality of Ejutla (60 km south of Oaxaca City) aims to bring affordable renewable energy to isolated hamlets. The innovative scheme relies on a design for a power-producing wind-vane, complemented by a solar panel for when the wind fails to blow. Constructing the system does not require any specialist materials or equipment, but relies on readily available components. 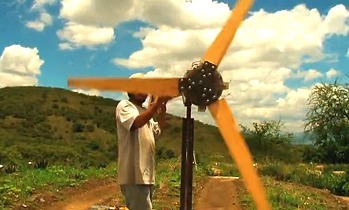 For example, the blades for the wind turbine are made of wood which means they are easy to repair and adjust as needed. Mexico’s cultural diversity is discussed in chapters 10 and 13 of Geo-Mexico: the geography and dynamics of modern Mexico. Rural areas are the focus of chapter 24 and development indices of various kinds are discussed in chapters 29 and 30. Ask your local library to purchase a copy today! The southern state of Oaxaca is famous for its lively and colorful markets. Many villages have a weekly market, and it is possible to travel from one market to the next during a week in Oaxaca without ever visiting the same market twice. The weekly cycle of markets in and around the city of Oaxaca, Mexico. Map: Tony Burton. All rights reserved. This is not a coincidence, since it is precisely what many of the market vendors do every week in order to maximize the number of people exposed to their salesmanship and wares. This is related to an important concept in central place theory, that of the threshold population required to support a particular good or service. Visiting even a single weekly market in Oaxaca is a fascinating way of experiencing first-hand some of the amazing cultural diversity of this extraordinary state.